The Ancestry Insider: Am Eye Seeing Things? I was having lunch with a good friend from the Generations Network the other day. "I see you have a new employee badge," I said. "I do," he replied. 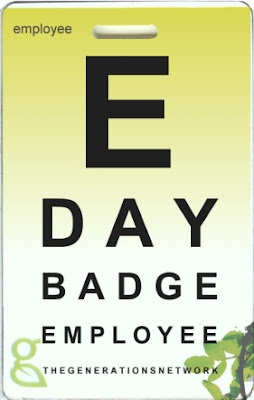 "I forgot my badge, so I had to check out a day badge." "I see," I said. I could see the badge reminded me of something. I just couldn't see what it was. I could see the nervous green duck; that wasn't it. Am I seeing things or does The Generations Network employee badge remind you of something too?